WinMerge • View topic - Installation error. The first two errors are during installation. The third error is when I try to start up Win Merge after installation. WinMerge will not run without vcredist installing correctly, so the first error is causing the other errors to happen. The error "Delayed Write Failed" usually indicates some low level driver and/or hardware problem, not specifically related to installing WinMerge. The Assertion failed box cannot show up without the required runtimes being in place. It is well possible that one can safely Ignore it, and it won't come back because it was just due to some missing registry entry which will be present once WinMerge has had a chance to create it. Another consideration is why do assertions fire in release builds? I found that to be related to the NDEBUG preprocessor definition. CRT's assert() takes effect when NDEBUG is not defined, whereas MFC's ASSERT() takes effect when _DEBUG is defined. 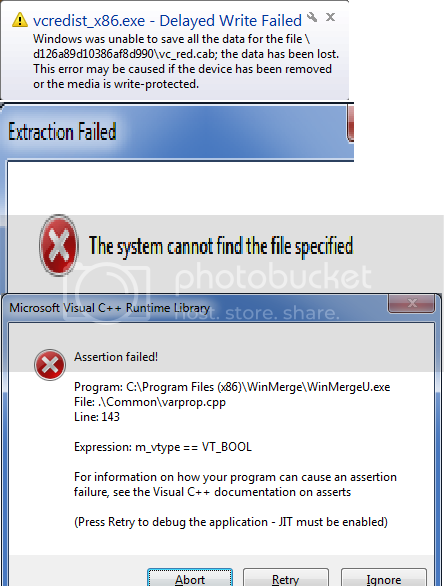 I ran the install again without errors, but upon starting up WinMerge, I received the 3rd Assertion Failed error again. If the issue disappears, repeat export of said registry keys (to the extent they exist). Please attach resulting .reg files for further investigation. Deleting HKEY_CURRENT_USER\SOFTWARE\Thingamahoochie\WinMerge let WinMerge start. I cannot reproduce the issue with the attached registry excerpt. Seems to be the one created after deletion of registry key and restart of WinMerge. Can you also provide the registry excerpt created before deletion of registry key?